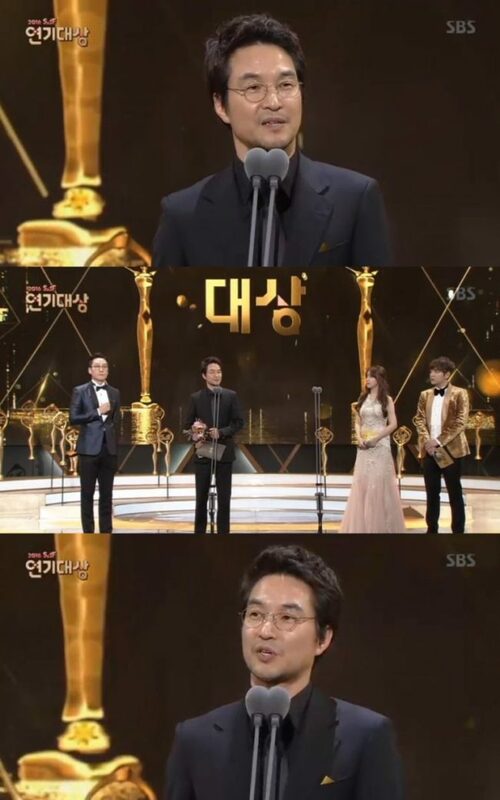 Han Suk-kyu took home the top prize for his role as a quirky, genius doctor on the popular TV series “Romantic Doctor Teacher Kim” at the 2016 SBS Awards Festival Drama Awards on Saturday evening. Han addressed the importance of embracing diversity in his acceptance speech, in a ceremony held at the SBS Prism Tower in Sangam-dong, Seoul. “A lot of people tell you to become a white canvas when you first begin acting. But I began thinking, couldn’t someone become a black canvas? Like the background of the stars at night? Those stars could not have shined without the dark background,” said Han. “If something makes us uncomfortable because it is different, we should embrace it with understanding,” he added. The actor has had a renowned career, in both film and television, and is best known for films like “Shiri” (1999) and the TV series like “Hotel” (1995). “Romantic Doctor” currently airs on SBS at SBS on Mondays and Tuesdays at 10 p.m.